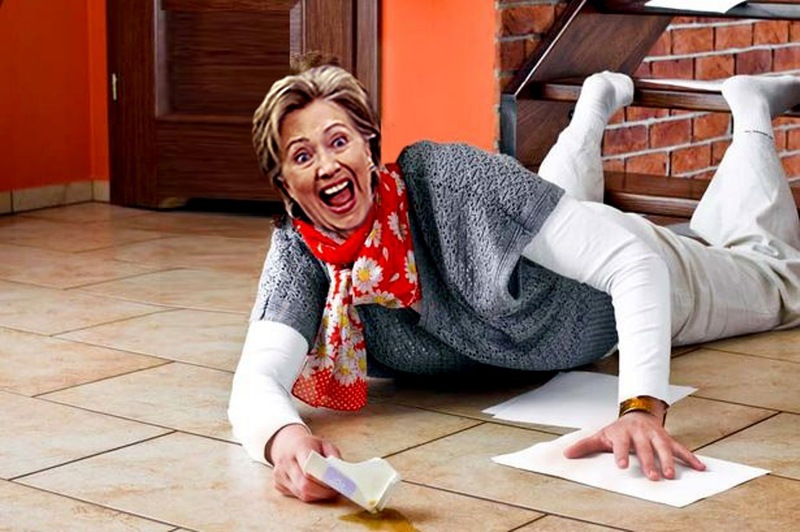 Can Hillary Recover From A Fall? If Joe Biden runs, can Hillary survive a fall (I mean a drop in the polls)? The Republican Party, for the first time in history, has been spending time, energy, resources, personnel boosting Joe Biden’s ego and yes even goes as far as marketing the vice president as a formidable candidate. I didn’t think I would live long enough to see the day when Republicans can actually side with Democrats on anything. Yes, they have; history made. They want Joe Biden to run for the seat of the presidency. Don’t’ be upset at the Republican leaders. They know what they’re doing. They are mounting attacks on all fronts to block a Hillary surge. And they have good reason to fear a Hillary nomination. They have been working for years now – since Hillary resigned as Obama’ secretary of state at the end of his first term presidency – to push Hillary down the stairs, so to speak, to damage her reputation. Republicans DO NOT want to face off with Hillary in the general elections. To that end, the Benghazi tragedy investigation has been an ongoing affair which will probably not end until the 2016 presidential elections are over. As the GOP Representative who may succeed Boehner as House Speaker, Kevin McCarthy, related in an interview accorded to Sean Hannity at Fox Opinion (known and referred to by most as Fox News) “Benghazi was all about doing political harm to Hillary Clinton”. Needless to indulge you that all Republicans including the departing House Speaker John Boehner are busy doing damage control for such comments. Whichever party you belong to, such under-handed, dirty politic maneuver should be of concern. As ex-president Bill Clinton related earlier this week in an interview accorded to ABC, the Benghazi investigation has been dragging on for no reason other than an attempt to hurt Hillary politically; the “supposed” investigation is now much longer than the Nixon Watergate scandal. Bill Clinton may indeed be right. During the Bush administration, there were 32 such attacks on US personnel overseas but the Republicans did not open a SINGLE investigation. So, why are Republicans so afraid of Hillary? Mrs. Clinton is a politically savvy individual, probably one of the best; whether she becomes such by “rubbing elbow with” her husband or she is a natural is a matter for another discussion. But Hillary has been immersed in politics at a very young age; she was in her early thirty’s, married to Bill for only two years when he became Attorney General of Arkansas. After only two years in that post, Bill Clinton became the 40th Governor of Arkansas; Bill didn’t get re-elected but when he ran again for governor in the 1982 elections, he won and began his term in January 1983. He served two terms as the 42nd Governor of Arkansas before running for president of the United States in 1992. Through the wins and losses of Bill’s political career, Hillary has always been by her husband’s side, learning the treacherous maze of politics. But Hillary was not just a shadow; she too has had her share of wins and losses in politics. An educated law student from Yale University – where she met her sweetheart Bill – Mrs. Clinton would learn early on that the job of a first Lady could only be glamorous if she takes a hands-off approach from politics, something she could not stand for. To jump start her political career, Hillary took the “doomed” task of implementing the Clinton Health Care Plan of 1993 (a universal health care plan) which failed to reach a vote in Congress. Mrs. Clinton is not one to take anything sitting down; so, instead of accepting defeat, she advocated for the creation of the State Children’s Health Insurance Program, the Adoption and Safe Families Act and the Foster Care Independence Act, all of which were successfully implemented, a sort of consolation prize for her big loss on the Clinton Health Care Plan. When her husband’s two-term presidency ended, Hillary did not resort to retirement as ex-first lady; instead, she launched a bid for the US Senate seat for the state of New York in 2000, won and served two terms as Senators. While in office, Mrs. Clinton ran for the presidency; anointed as the Democrat favorite, her campaign was blindsided by a junior Senator out of Illinois, Barack Obama, whose community activism experience, eloquence and “a pinch of luck” contributed to his ascendance into the Oval Office. Despite Bill’s unrelenting campaign on behalf of his wife, it all boiled down to a historic event, the election of the first black man as president of the United States. According to rumors, Obama mulled the idea of Hillary as his running mate but was afraid her popularity as a Clinton would overshadow his presidency; when the dust settled, Mrs. Clinton was offered the post of Secretary of State which she accepted at the last minute as a way to bury the hatchet between the Obamas and the Clintons as well as to acquire international experience. After serving as Secretary of State in Obama’s first term presidency, Mrs. Clinton resigned to contemplate and prepare another bid for the Oval Office. Clearly Mrs. Clinton has both domestic and international experience; after so much time in the political arena, there is not a single Republican candidate out there who can match her vast knowledge and experience. Unable to find a worthy opponent to face off with Mrs. Clinton in the general elections, the Republican political machine is determined to push her down even if it means taking a tumble also. Kevin McCarthy’s is only one such instance; more may be coming. Regardless the strategy however, a fall is a fall. If the Republicans’ prayers are answered – Joe Biden joins the race – it may not be easy for Mrs. Clinton to recover from a fall. ← Could Hillary Be Forced To Drop Off The Presidential Race?